If I ask you, what do you think about Lombok? Will you answer it’s a kind of vegetable? Hahaha forget it. In Javanese Language, Lombok is known as “Cabai” or “Cabe”. But this is not what I mean right now. Lombok is one of thousand beautiful islands in Indonesia. It’s a small island located in West Nusa Tenggara province, near Bali Island. Lombok is being popular because of it’s beaches. Well.. for a sea-lovers like me, it must be in my “must-visit places list”. Last year, in May 2016, my family and I were visiting Lombok for 4D/3N. We could visited the west part of Lombok, the east part, and also the south part. It costs around IDR 6.000.000 per person because we booked it when the time is very tight and also in the high season. Yea I know it’s a quite expensive trip. Actually the touring cost was not too expensive, it costs only around IDR 2.000.000 per person (already including accommodation, driver, tour guide, hotel, boat rent, and food). My dad actually add IDR 1.000.000 more per person to stay in the best hotel in Gili Trawangan, named Vila Ombak Resort. But the only thing that makes our trip expensive was the flight tickets. It was IDR 3.000.000 for the round trip. Expensive right. It’s similar to flight tickets for going abroud. But beside that, the food, service, and also accommodation were excellent. Well, starts from the first day. My family and I were visiting the Sade Village. It’s a village in Lombok where there are still a lot of Sasak Tribe people. It was pretty cool to know about their culture. I saw their traditional house, traditional clothes, and their traditions. One of their traditions which I still remember is they should do eloping for married. I still can’t understand what is the purpose of that tradition. But yeah let’s move on to the next stop. The next was visiting 2 beaches in the south part of Lombok Island. Don’t you know that Lombok Island also having a beach named Kuta? Yeah, the name of the beaches was Kuta Beach and Tanjung Aan Beach. It was almost similar to each other and I can’t even differentiate them. They had pure blue water, rocks, brown sand, and some little hills. They were close to each other. And… when we were on our way to the beaches, we could see buffalos crossing the road. The plants and roads in this area was much different with the view in Java Island. Of course because this area is located in central part of Indonesia. Next day, we went from the west part of Lombok Island to the east part. We were visiting Pink Beach. The local people said that the sand in the island could turn into pink colour because of the red algae. We were do snorkelling in the middle of the sea, from the top of the boat. After that, we ate crabs, and a lot of seafood there. Such as shrimp, fishes, and shell. We also visited a small island called Pulau Pasir. We could find and touch a lot of starfishes there. The island is actually a small island without villager. Because this island would sink on the night, when the sea water tides. After we spent half day in the east part of Lombok Island, we were visiting Sukarara Village. Sukarara village is a small village in the west part of Lombok Island, where the main activity in this place is weaving. This village is located in the central part of Lombok Island. Almost all of the women in this village worked as a weaver, to produce traditional fabric or clothes called songket. Songket fabric of Sukarara Village has it’s own characteristics with different designs with the other fabrics in Indonesia. I bought a piece of beautiful pink songket fabric there. Before that, I also tried to do weaving with hand, using the teak trunk to make a fabric. Raw materials they use to make the songket are cotton yarn, silk, gold silk and silver silk thread. As for the dyes they use are from natural dyes such as reddish brown color of mahogany, light brown color of teak trunk, brown acid soil from seeds, dark brown color of rotting banana stems, and purple color of the mangosteen peel and wine. This makes the woven fabric or songket of Sukarara village is famous for its characteristic bright patterned songket. And also the weaving village of Sukarara are now widely known and well liked by foreign tourists. The last destination for the second day in Lombok was visiting Banyumulek. Banyumulek is a place for pottery crafts. It was located in the West part of Lombok Island. After we were visiting this place, we ate Lombok’s traditional food called Taliwang chicken. It’s a spicy Indonesian grilled chicken dish from Lombok. After eating, we were visiting one of the biggest pearl shop in Lombok. My mom was buying 3 rings and 3 necklace pendant for herself, my sister, and I. And then finally we went back to the hotel. The name of our hotel is Golden Palace Hotel. It’s located in the capital city of Lombok, Mataram City. Near the hotel, we could find a quite big mall named Lombok Epicentrum Mall. Don’t be shocked that Lombok has a big mall too hahaha. One thing I admire about Lombok is there was no traffic at all. And even I could only find one traffic light in this island. On the following day, we went to Gili Trawangan. In the journey to Gili Trawangan, we passed Malimbu Hill and took some pictures besides Senggigi Beach. Malimbu Hill is the best place to see sunset in Lombok. It has a lot of beautiful views. We could see Senggigi Beach from the top, Gili Meno, and also Gili Trawangan. After we arrived in Bangsal Port, we crossed the sea using a speed boat. We also stopped by in Gili Air and Gili Meno, smaller gilis near Gili Trawangan. After we arrived in Gili Trawangan, we checked in into our hotel named Villa Ombak Hotel. We got a really delicious orange beverage for aperitif when we checked in, but I forget the name lol. We could find too much tourists in those hotel. We also can rent a bicycle to get around the island or rent a dive boat for travelling around the gilis. In Gili Trawangan, I spent much time for snorkelling and taking pictures in the sea-line. The water was too pure and had a gradation of colour, between blue, turqoise, and green. I was doing snorkelling there and saw the beautiful fishes, turtles, and corals. On my personal thought, Lombok sea is better than the sea or beaches in Bali. Because it’s still natural and not affected by trash and people. I took some selfies under the water but the pictures quality were bad because I only used my cellphone. In my free time, I just walked around the island. I spent 30 minutes to walk half-round Gili Trawangan by the sea-shore. And guess what, I could find a swing at the seaside. 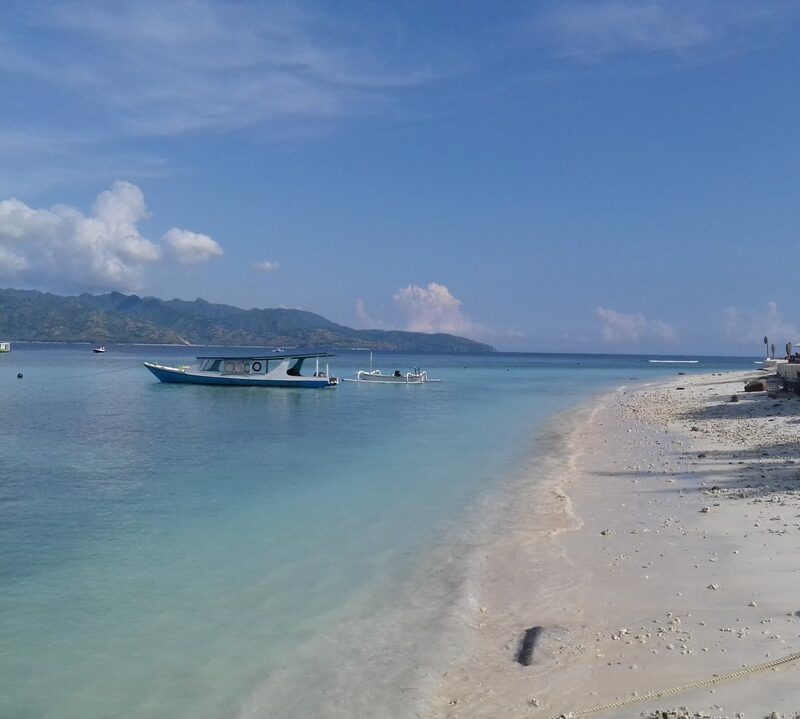 Another tips : Don’t forget to rent a “Glass Bottom Boat” in Gili Trawangan for another option if you don’t want to do snorkelling. Because you can see turtle, fishes, and also corals from the bottom of the boat. It costs around IDR 1.000.000 for each boat. You can share it for maximum 10 persons.